resoles, OCast resola, raroles, OCat frexols, ffrexols, mercies, Cat rissoles, Gal freixó, MEng risshewes, rysshews, Eng. rissoles, chitterlings, small intestines of beasts such as pigs. Originally, they were fritters prepared that were fried or boiled or they are sometimes filled with mincement or forcement to make sausage. Later the stuffing became known as rissoles, with or without the encasings. They can be composed of giblets from different meats, liver, cheese and other mixtures including fish, vegetables and fruit. Then it is cooked in lard or oil. They were common in Europe and still are made today. 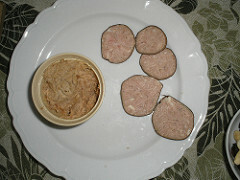 They are described in Sent Soví in Chapter VI as goat sausage. The goat is stuffed with it instead of the intestines. In Chapter CXXI, they are made with mutton or pork and covered with eggs if desired. Recipe CL “Qui parla con se ffan resoles de paste e d’ous e de fformatge,” is for cheese fritters. Nola makes breaded or unbreaded rissoles and bakes them rather than frying them. Anderson describes those of England as rolled fried thin pastries or small thick cakes containing chopped meat or fish and mixed with breadcrumbs. At the same time one 15th C Harleian MS. 4016 recipe for them consists of making fruit cakes and frying them, while another calls for marrow. Currently, Joesf Lladonosa uses goat meat and covers it with strips of the peritoneal membrane (the membrane covering the abdominal cavity). See buñuelos. Wash the stomach and intestines of a kid. Scrap them with a knife and scald them in boiling water. When clean cut into small pieces and do the same with the heart and bacon, without skin. Gently fry in a pot with a little olive oil and season with sat and a mixture of spices. Remove this from the pan. Drain off excess grease and add slightly beaten eggs. Separate the peritoneo from the belly and scald it in ht water taking care that it does not break. Cut it into pieces according to the desired size and extend them on a table top. Place the mixture on top. Wrap them with the pieces of pertioneo. Fry them in a little grease or olive oil until golden brown.